This trio of Halloween projects are quick and easy to make completely in your embroidery hoop. 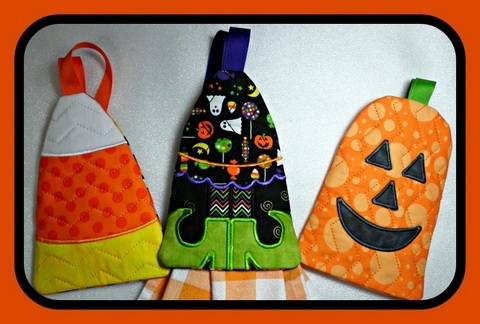 This page includes all three of the Halloween Cuties projects in one purchase, a towel keeper, a zippered bag and a treat bag. Click on the item listed below to see the individual pages for detailed information on each set. Save $9 by purchasing this complete set.